We believe in Food Tour Freedom. Choose what you like and how much. Started by a caring local these unique larger group tours are like a fun excursion. 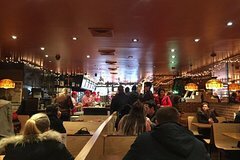 Great New York cheap eats near Times Square but a world away! Our very different from the standard food tours have hosted about 40,000 guests and have won the TripAdvisor Certificate Of Excellence seven years in a row. Our format allows you to meet/mingle with others from around the world on our unique subway/walking eating experiences. We are known for our unbiased restaurant recommendations. We help our guests potentially save hundreds of dollars so take our tour as early in your stay as possible to eat great and save real money. Tour includes about 5 stops in one of the great eating neighborhoods in Manhattan. Venture away from the tourist areas with multiple cuisine stops including at least one sweet stop. Food On Foot Tours is a member of the TripAdvisor Hall Of Fame! This quality fresh food eating tour in one of New York's fun eating neighborhoods is a different experience from standard food tours. You are on a real eating tour for those who love food and want to experience real New York eating. This is not a sampling tour and you do not stand on the corner and get a piece of cheese, leaving you wanting more. Ticket includes a $15 food credit. You choose what you like and how much by purchasing small items at each stop while spending just $15 to $20 on average for food on the tour and the tour will replace a restaurant meal. Since this is first and foremost an eating tour you will experience the city and its eateries the same way New Yorkers do - by subway and on foot.